Anthony Stokes has apologised for posting two angry tweets after being left out of the squad for Celtic's 3-1 win over Inverness Caledonian Thistle. The striker complained that he had travelled north in vain and insisted playing was more important than money. "Sorry for earlier tweet. Hope fans can appreciate my frustration. Heat of the moment," said 27-year-old Stokes. Celtic manager Ronny Deila told BBC Scotland that his comments would be dealt with internally by the club. Stokes, who has appeared twice this season, was an unused substitute for Thursday's Europa League defeat against Ajax and was part of the Celtic party who travelled to the Highlands for the Premiership encounter. "Buzzing to be brought all the way up to Inverness with the team to sit in the stands today, lovely weather for it too," Stokes tweeted ahead of kick-off. He added: "Who gives a f*** about wages when you're not playing! It's about playing and contributing, not picking up a wage." The response from Celtic fans on Twitter was mixed, with some saying he should be in the team and others suggesting such comments are why he is not involved. Responding to a tweet suggesting he is happy to pick up his wages, Stokes wrote: "Obviously I am! You would too if you were doing double sessions every day, fit and ready to play." 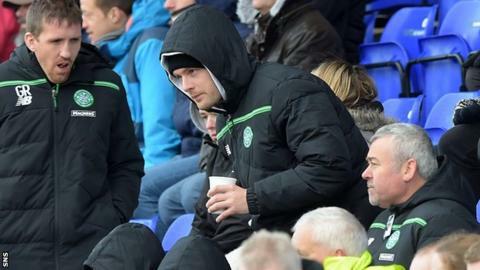 Asked about the comments ahead of kick-off, Deila said: "That showed a lack of respect to the other boys. We will handle that inside. We will see what we will do. It is not the best way to behave for your team-mates." Stokes, capped nine times by the Republic of Ireland, was left out of the squad to face Inter Milan in February after what Deila said was a disciplinary matter following a trip by the player to his homeland. The Celtic manager described it as "a small thing" that was also dealt with internally. Stokes went 12 games without scoring at the end of last season, his last goal for Celtic coming in a 4-1 win over St Mirren on 14 December, and he has only made two appearances this campaign. He was a late substitute in a 2-0 win over Stjarnan in a Champions League qualifier and he has not featured since starting in a 3-1 win away to Dundee United in the Scottish Premiership on 22 August.